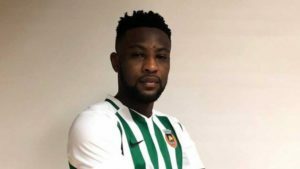 The Portuguese top-flight side has announced the signing of Ghanaian forward Said Ahmed Said. The former Inter Milan forward joined Rio Ave FC on the transfer deadline day on Thursday. The 25-year-old inked a three-year deal with the Primeira La Liga club after passing a mandatory medical test on Thursday afternoon. He has joined the Green and White lads from HNK Hajduk Split on a transfer fee around 500,000 euros. He is still eligible to play for Ghana despite representing Italy at the U19 level. Said netted 21 goals with fifteen assists in his 67 appearances for HNK Hajduk Split in all competition during his stay.